I have just bought a yearling filly and gelding, they arrived last monday, and are currently kept in a large loose area of the barn because the ground is sodden here still! and she will walk right up against me, often standing in front of me and pushing against me when i move, for example, skipping out, i will be skipping out, and she will suddenly wander over with her ears flat back (Like image) and stand as close, Practically on top of me, as she can. I know in her previous home where she was bred she was titbitted alot with polos. But please can anyone offer any advice? The gelding doesn't show any of this behaviour at all and is a reserved/shy little guy whereas she seems to be pushing the boundries a little to far! I have a similar filly who pushes the boundaries a lot! She has kicked and run of over too. Now i go in with a headcollar and schooling whip. She is caught and expected to come with me whatever i am doing eg poo picking . When she comes too close she is asked to back up by poking her in the chest with the stick handle, not my hand as she used to strike out or go up with the word back said loudly . She will now back up on word alone so i can be safe in the field. Working on the attitude still! Don't read too much into flat ears at this age..especially if there is no aggressive behaviour alongside..shoo her away calmly if she does it but give lots of scratches and attention when she doesnt. my yearling's ears go back when I feed him and he is not at all aggressive. It isn't her fault she has been given treats so just has to learn you will never have them. I never give treats til they are at least two. - I forgot to mention though, these two arn't lead-able, and still getting them used to being handled, but its hard when she's coming towards you and nipping your arms, legs, anything!! I've tried poking her on the nose (Fairly hard.) and shouting A-A-A!!! when she does come at me, but this doesn't make much diffrence! Just a thought but do you spend some time with them..grooming or scratching etc..before just going in to do jobs? She could actually be extremely affectionate and wanting some contact and reassurance...I would be inclined to go straight up to her when I arrive and give her that..then if she still invades my space gently show her it is not acceptable and shoo her. She's very nippy, not too aggressivly, but i think that was from being treated all the time! When i put their feeds out (They have a handful of youngstock cubes, just because they are inside and only on hay!) she will almost chase me with her ears like that and swing her a**e round towards me when i walk past her! I'm just worried, i'm a first time yearling owner and i'm worrying about everything! You never said she was nipping you in your original post..if she is throw a rubber skip at her backside and growl loudly. Oh yes! I've sat in their stable alot during the day, just stroking them and scratching, but even then, ears are back and when i move or walk across she's following me, and practically standing ontop of me! Mine was an unhandled foal, tb and rude ! She will probably find learning to lead easier she just does it in the field. The little contact mine did get was rough and aggressive. Sounds like she has not been taught manners. Stick with it.. Stay calm .. Dont ever give treats .. She will come good. If in all the time you could sprinkle some of their nuts in their bedding .. Keep their minds occupied too. I think i'm going to wait to teach them to lead when they are out in the field, at the moment it seems hopeless because if i'm trying to work with her, the geldings in the way, and if i try and work with him she is in the way! Tried seperating but that didn't end well, atleast if they are in the field i can bring one on the yard and its not so much like they are seperated then? Build up trust first, I've found poking the nose (punishment) just sets me back and confirms that I am a predator and not to be trusted, pinching etc usually aggravates the situation and can become a game. Of course you can't have a horse charging or threatening you, I would take a lead rope out and just swing it to show this is my space keep out and use confident assertive body language. When my filly did this I would drive her away, waving arms, swinging rope etc until she came back to me only when submissive, quite like join up. With the nipping I wouldn't let her into your space full stop yet unless invited. Eg even if she just comes and puts her nose near just calmly move her head away, good for when tying up so you don't get a horse chewing your coat or even worse nipping your rear when picking out feet! As always Id always recommend an IH associate to come and start you off with handling, it's hard to explain how to use body language as theres so many variations, learn as much as you can on pressure and release, advance and retreat. I think she was very spoilt in her old home, constant treats, the owner loved them to pieces, but they lived out in a large herd and wern't handled just fed polos every five mins! I will try the nuts, they have a salt lick in there, but they don't seem very intrested in that! Remember you are always training, you can easily start some yielding exercises now, just brief sessions will really help before leading to field. Pinned ears do not always mean aggression. 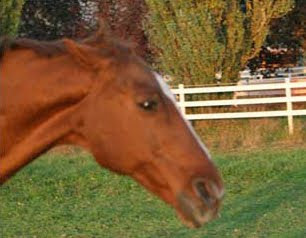 I have known three adult horses and one yearling whose natural reaction to being close to a human is flat back ears. All of them have not been in the slightest bit aggressive. Some horses are just like this. I have also discovered it is hereditory. The mare on my yard who had a foal last year does this, and so does her foal! Both are extremely affectionate and love closeness and cuddles. I have to explain to people who go up to stroke them both that they are not being aggressive. It is their natural demeanor. However, your yearling should not be allowed to invade your space unless invited. I agree with others who have said 'no treats'. Giving treats CAN cause aggression in some horses. I am sure that your filly is not being aggressive. But what I do when skipping out our yearling is to give him a fresh pile of haylage and not allow him to come up to me when I am skipping out. I wave him away, and he now knows that when I am skipping out, I do not wish to engage in any fussing or grooming or play. Thankyou!! Treats are now banned!!!! TBH, you'll probably have more trouble leaving one in the field if they've never been separated, that's an accident waiting to happen IME. To do that they both need to be very handleable and TBH, the first few times you do separate it would be better if one was left in a safe stable that they couldn't jump out of or damage themselves in as it's going to be a very stressful thing for them. You'll have more success teaching them to lead in there even if the one does come up and interrupt you. The filly is halfway there because she follows you anyway, just hold onto her headcollar and do the walking on and whoa after a few steps, give her a scratch and repeat. Do the same with the lad too, they often learn by example which makes it easier. If he should not move forward then you can always push him along. It stands to reason that you get them so they are happy to have you behind them as well as in front. Always wear gloves and a hat and make a point of giving them a fuss every time you go in so that they learn that you are a nice person to be around and never ever give them a treat from your hand; that is the ruination of many young horses which then get a reputation for being bargy (and are as in your filly's case) when it's not their fault at all, just their stupid owners. This, we have bought a couple of babies who appeared to be aggressive but were actually just incredibly curious but nervous and have developed into lovely ponies with consistent handling and manners having been put in place. Just as an aside, I treat all the time by hand (as part of training) and it has never caused a problem with any of mine. Start with getting them haltered and handled and do loads of groundwork to teach them basic commands and manners. Handle her in the same way as the gelding and be firm but fair, she will soon come around, if she nips push her face away from you and hold it away for a few seconds, increase the time if needed, then carry on as normal. If she is crowding you then, for now, don't get yourself into that situation, don't allow an opportunity to arise until you are more sure of her. It is so interesting to read differing methods and ways of handling. If I used treats on my two they would both be vile pushy creatures, the gelding would be the worst. He came to me feral and I did use bits of apple to kid him into allowing me to touch him at the very beginning. Even though he was very nervous it did not take long before he viewed me as a food supply and invaded my space, not ideal with such a large yearling. For the OP's two I would put them in adjoining stables and just keep spending time with each, I would put a soft leather headcollar on the filly and leave it on with a short piece of soft rope and then do plenty of groundwork, pressure and release, move over, halt etc. The only reward I use is a scratch on the wither. I find a simple rope halter slipped over the leather headcollar is the easiest thing to use for groundwork lessons. There is certainly no need to be rough with the filly but consistent firmness and the use of step back will soon instill respect in her. Good luck, I hope you find working with her and watching the changes as rewarding as I did with mine. I don't think it's treats I think it's nerves. She doesn't know you, you are coming into her space and she is doing what she would in the wild, threatening you so that you back off. Ignore it apart from a firm "no" and spend a lot of time reassuring her that you are not a threat. My NF used to spin and present her back legs, pure fear. Though she was such a coward, it just took a louder voice to send her off across the paddock. Still lays her ears back and makes faces when you ask her to do something that she's finding a confidence challenge. I have also discovered it is hereditory. The mare on my yard who had a foal last year does this, and so does her foal! . That is more likely to be learned behaviour. Thankyou everyone for your advice! AA - I think i will put them into adjoining stables, it is difficult to give one of them attention without the otherone hanging onto my pocket zips, or the filly shooing the gelding away! I think all treats are now banned from these two! I will have to let my mum know as she has been treating them everytime she goes up the yard! Once again, thankyou all for your brilliant advice, these are my first yearlings, and i'm pretty new to it! So will be coming here for lots of advice and asking you all lots of questions!! If she's standing all over you get jer out of your space and get her to realise that that sort of behaviour isn't acceptable. Its the sort of thing that turns into a dominance issue then one day you have a mare that thinks she's the boss and then you will have a fight on your hands. Ok so she is nipping a bit (probably because she is expecting food as that is what she associates humans with). I would just get your elbow in the way if she does that to be honest. Pinning ears back with head low can also be sign of a submissive horse which sounds more likely as she does not sound like she is being aggressive, more curious as to what you're doing. my youngster (got him at 15mths) was very mich the same but then he had been well-handled (still a little spolut with food treats) but he jsut wanted to know what people were doing in his field so he would follow (he still does a bit and he's almost 4). it's an inquistive, baby thing as is the nipping so I would not read more in to it than there is. As for the swinging her bum round when you've fed her - you said she was previously in a field with others so it is quite natural for her to be defensive over her feed. Again, mine dd the same, would occasionally kick out and I just made sure I did notget near his bottom when feeding, just left him alone. A quick pat on the neck and a "good boy" maybe but then just leave him be. Mine still puts his ears back whenever you take feed/hay out and if you are doing stuff in the field (especially with a wheelbarrow! lol). He is not aggressive. That is not to say I haven't had to put him in his place before for sme bolshy behaviour (ie nipping whilst being lead). I used a rattle bottle in the initial stages when he did this. They do improve though once you know them, they know you and you are clear about boundaries! Personally I'd never hand treat a youngster. Their behaviours & manners need to be firmly established before I'd do it, then not very often & never to the point where they expect it as the norm. My 6 yr old wouldn't know what a polo was, but she gets carrots daily in her feed. As a reward she gets fuss from me & a scratch in her favourite spot. My horses have become nicer since the treats stopped, not saying I never give them, but its now and again, rather than constant, now they come to me for a neck or bum scratch rather than food..
Have to say though I do find mares a lot more bossy and can try to dominate, had all mine from babies, and Ive been firm but fair, but the mares will still try to push the boundaries sometimes. Mine does this too, I often wonder if it is to allow less wind resistance so he can get his head in his bucket quicker. Again though, not a nasty bone in his body. haha... yes probably, mine sure likes his food... when its feed time mine canters up and down the paddock (he lives out) does a sliding stop out the gate (he would make a great self-taught western horse) ears flat back at the 2 mares the other side of the gate, then turns to me, ears still flat, and then plonks his head in bucket..... funny creatures..
My 5 year old mare used to be quite aggressive in the field, ears pinned back, would read at you (no where near close enough to actually hurt you) just a threat. She's quite a dominant mare but when turned out with other horses she will let them 'herd' her, she accepts this and is never aggressive towards them so I figured.. Ok - other horses mover her and effectively choose where she goes and she respects that so I must do the same. If I approach her and she is aggressive I will make her move, with body language, clicking,flapping a lead rope against my leg or whatever works. I will make her move and move and move until she shows signs of submission and attention on me e.g ear flicking towards me, licking and chewing, lowered head etc.. When she shows any of these signs I stop, I would expect her to look at me respectfully and allow me to approach her with no agression if she doesn't then I move her again and repeat. The key is not to move them as in chase them and make them run from you but just so they are walking out and you are 'herding' them from the driving position. It works very well for my mare and she is very rarely aggressive now. Excellent advice! Or a bucket of water if that's what you have handy! I generally have to do this ONCE with most of my weanlings when they come in - the odd one demands 2 or 3 such treatments. Either biting or kicking gets the treatment - there is NO excuse and no tolerance shown for this behaviour.